Nominations for the 2019 Fred Hollows Humanity Award haven't started just yet. Register your interest below and be notified as soon as they open! 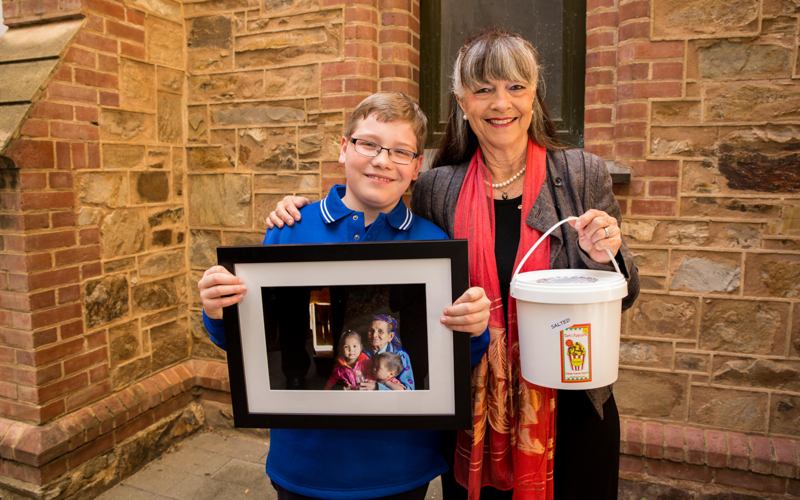 2018 South Australian Junior Ambassador Samuel Weavers with Gabi Hollows. What is the Fred Hollows Humanity Award? The Award recognises Year 6 students who follow in Fred’s footsteps by making a positive difference in their community. It celebrates students who show compassion, integrity and kindness in their everyday lives, just as Fred did. Since 2012, the Award has recognised more than 1300 primary school students across Australia. In 2017, the Award expanded nationally for the first time with students from all states and territories eligible for nomination. Teachers, principals, parents and members of the community are all encouraged to nominate. Any Year 6 student who embodies the values of compassion, integrity and kindness. All nominees will receive a certificate and select nominees will be recognised at a presentation ceremony in their state in Term 4 where a Junior Ambassador will also be announced. Thanks to our charity partner Specsavers, these state Junior Ambassadors will extend their humanity by allocating $5000 each to a Fred Hollows Foundation program of their choice to help us end avoidable blindness! When do 2019 nominations open? Register your interest to be the first to find out about the 2019 Fred Hollows Humanity Award. We'll send you an SMS when nominations open.